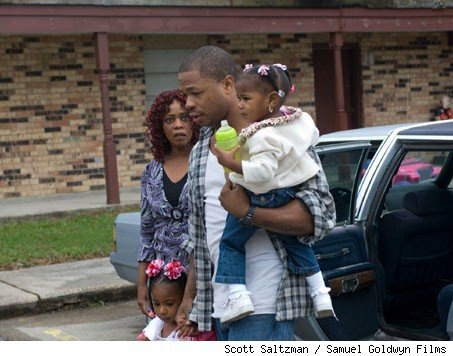 Based on true events in the midst of the 2000 election, AMERICAN VIOLET tells the astonishing story of Dee Roberts (critically hailed newcomer Nicole Beharie), a 24 year-old African American single mother of four young girls living in a small Texas town who is barely making ends meet on a waitress’ salary and government subsidies. On an early November morning while Dee works a shift at the local diner, the powerful local district attorney (Academy Award® nominee Michael O’Keefe) leads an extensive drug bust, sweeping her Arlington Springs housing project with military precision. Police drag Dee from work in handcuffs, dumping her in the squalor of the women’s county prison. Indicted based on the uncorroborated word of a single and dubious police informant facing his own drug charges, Dee soon discovers she has been charged as a drug dealer.